Credit & Copyright: S. Maddox (Nottingham U.) et al., APM Survey, Astrophys. Dept. Oxford U. Explanation: Our universe is filled with galaxies. Galaxies -- huge conglomerations of stars, gas, dust -- and mysterious dark matter are the basic building blocks of the large-scale universe. Although distant galaxies move away from each other as the universe expands, gravity attracts neighboring galaxies to each other, forming galaxy groups, clusters of galaxies, and even larger expansive filaments. 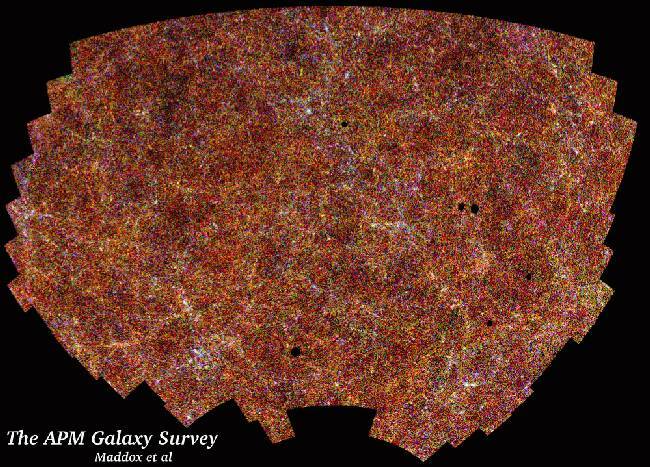 Some of these structures are visible on one of the most comprehensive maps of the sky ever made in galaxies: the APM galaxy survey map completed in the early 1990s. Over 2 million galaxies are depicted above in a region 100 degrees across centered toward our Milky Way Galaxy's south pole. Bright regions indicate more galaxies, while bluer colors denote larger average galaxies. Dark ellipses have been cut away where bright local stars dominate the sky. Many scientific discoveries resulted from analyses of the map data, including that the universe was surprisingly complex on large scales.